Upgrading the machine with in-process error proofing required two new functions: embedded sensors and servo spindle feedback. To ensure that the threads roll and form correctly, spindle feedback monitors torque and embedded sensors in the tooling monitor the stroke. To complicate matters, the tooling is installed on a rotary index table. To connect the sensors in a modular fashion, E & E called on Balluff, Inc., Florence, KY, which installed its noncontact couplers (see photo) designed to send power and sensor signals across an air gap. 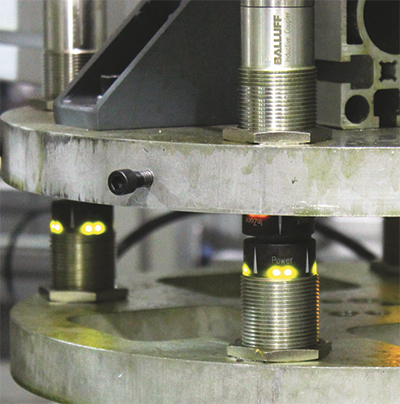 For its application, E & E is powering error-proofing sensors embedded in the interchangeable tooling. As the index table rotates into position, the sensors are powered on and their status sent back to the control system. With no hard connection, the machine is free to rotate beyond 360 deg., as required by the manufacturing process. The noncontact couplers provide an additional benefit when it comes to changing the process over for a new part. The process is as simple as opening the mechanical clamps and exchanging the complete tooling block—no physical cable connections required. This has reduced changeover time from 6 hr. to just 30 min.